The weather today cooperated with the successful recovery of three of our deepest deployed Abalone seismometers. The seas were calm, with 3 to 6 foot swells. The wind was out of the north, picking up to 11 knots as evening approached. 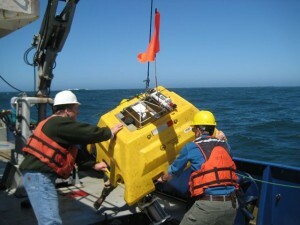 The depth of the seismometers’ deployment directly effects their recovery time. 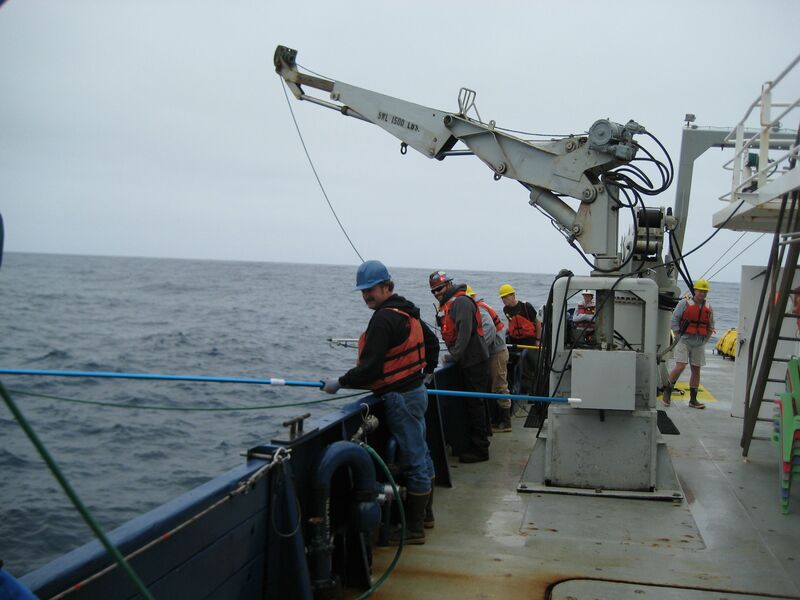 After an acoustic signal from the New Horizon is sent down to the Abalone’s release wire, we wait 7 to 8 minutes for the wire to burn through. 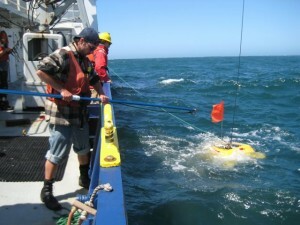 We actively range on the Abalone as it ascents. Since the ship is stationary, the amount of time for the acoustic signal to travel up from the seismometer steadily decreases. The three Abalones that we recovered today (J43, J44 and J36) were deployed in depths ranging from 2654 meters to 2821 meters. The deepest seismometer (J36) that was signaled at 21:26, didn’t reach the surface until 22:10, and required a 44-minute ascent time. About twenty feet from the surface, a pressure-activated strobe is activated. 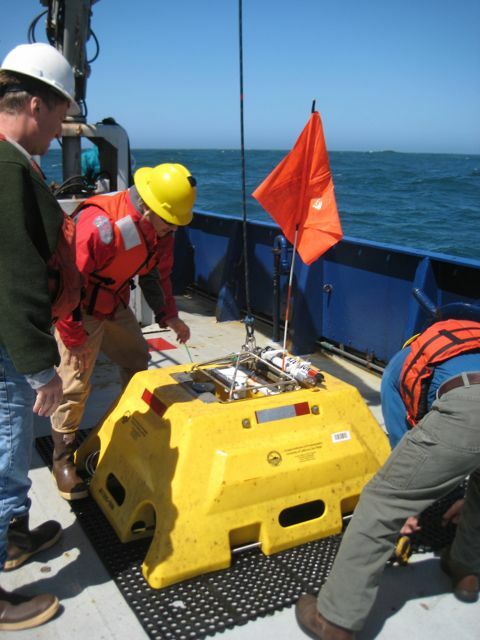 There is also an orange flag on top of each Abalone, but since this particular recovery was at night, we relied on the strobe in order to navigate the ship into close proximity. Once sighted and illuminated by spotlight, the New Horizon maneuvers to bring the Abalone along its starboard side. This is a delicate procedure, requiring a slow forward speed and bow thrusters so that we can bring the ship close enough to attach a tag line to the top of the Abalone. One of us uses a telescoping pole with detachable grab hook attached to the tag line. Given the roll of the ship, large ocean swells and the vertical bobbing of the Abalone, this procedure can be very challenging. If we are unsuccessful, the New Horizon must turn into the sea for another attempt. Once the first tag line is attached, another line from a telescoping pole and detachable grab hook is attached to the Abalone. The other end of this line is connected to the deck crane, which does the heavy lifting. Even after leaving the 300-pound weight on the ocean floor, the Abalone weighs over 550 pounds. Immediately after the crane lifts the Abalone from the sea surface, another tag line is attached to its bottom. 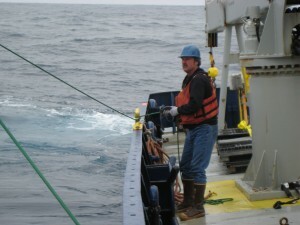 By maintaining tension with the first and third lines, the Abalone is prevented from colliding with the ship. 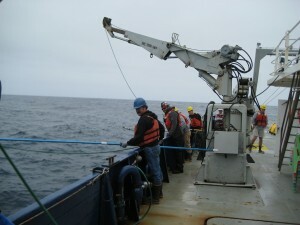 The crane continues to lift, then turn aft, positioning the seismometer of the deck. 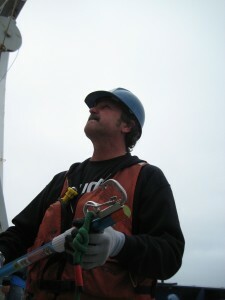 Tag line tension is eased as the crane slowly lowers the Abalone and is secured to the deck of the New Horizon. 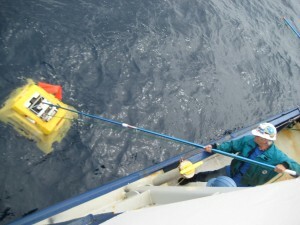 All of the data that the seismometer collected during its months on the ocean bottom is stored in the red data logger. The data logger is removed from the Abalone and quickly taken into the ship’s science lab to begin analysis.